Junior netminder Jake Oettinger, who stopped 75 of 79 shots in the two game Friendship Four Tournament, is Hockey East’s Defensive Player of the Week. The Dallas Stars’ 2017 first-round draft pick posted a 2.03 GAA and a .949 save percentage for the tournament and was named BU Player of the Game against Connecticut. Ty Amonte, who scored the game-winner against UConn and the Terriers’ lone goal against Union, was named to the weekly list of Top Performers. Chris Higgins, a first-line forward on BU’s 2009 national championship team, played three of his final four pro seasons with the Belfast Giants, scoring a combined 135 points and becoming a fan favorite. David Quinn spoke candidly about his battle with hemophilia, which cut short the playing career of the former BU captain and NHL first-round draft pick and sent him into coaching. Brady Tkachuk scored twice in less than two minutes in the third period to rally Ottawa from a two-goal deficit, en route to a 4-3 win against Philadelphia. Tkachuk, who had assisted on the Senators’ first goal, now has 16 points (9G, 7A) in 14 games. Alex Chiasson scored his ninth and 10th goals in a 5-2 Edmonton loss to the Kings. A Stanley Cup winner with the Capitals last season, Chiasson is third on the Oilers in goals and fourth in points. Nick Bonino scored his fourth goal and added an assist in Nashville’s 5-2 win against Anaheim. BU Hockey season ticket-holder Bruce Haas has authored a book titled “Great Game! D1 College Hockey: People, Places, Perspectives.” It includes interviews with Jack Parker, Brian Durocher, Dan Ronan, Brad Zancanaro, Ken Roche and Jason Lawrence. It’s available from Amazon, Barnes & Nobles and local bookstores. 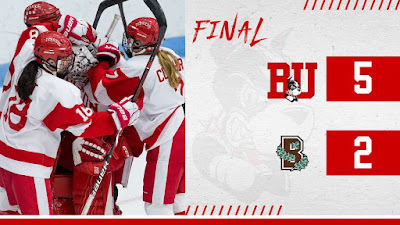 A trio of third-period goals broke a 2-2 tie, sending BU to a 5-2 win against Brown at Meehan Auditorium in Providence. 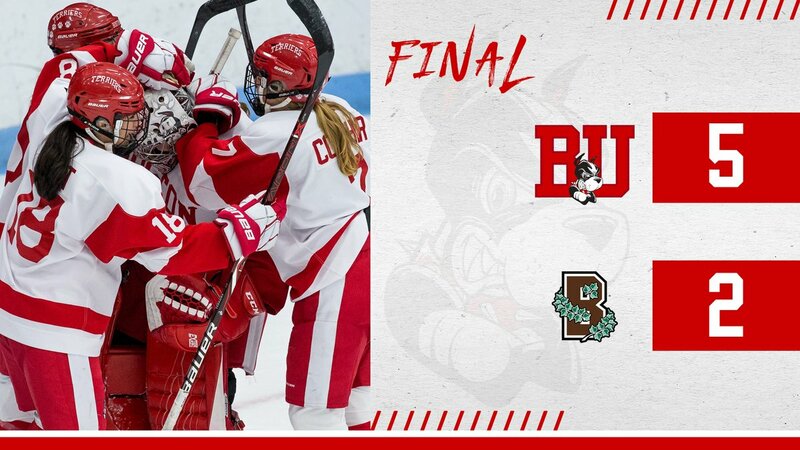 Regan Rust scored the game-winner halfway through the period, which was followed by scores by Nara Elia and Mackenna Parker. The Terriers also had goals from Connor Galway and Sammy Davis. Corinne Schroeder stopped 15 Bruins shots.